(Left) Dynamic urban-camo patterning on the Socom 16 emphasizes the weapon's suitability for law enforcement use. It is ideal for forced entry and offers intuitive controls and superior balance. (Right) With a Kestrel 4000 meteorological sampler, customized ballistic computer and Horus Vision scope system mounted on the M25 White Feather, these Federal match cartridges aren't likely to miss the target. From door-kicking to thousand-yard threats, there's a Springfield for it. "I hear a lot about concerns with the performance and reliability of current designs, and I say, 'Hey, proven design, bigger cartridge, heavier bullet--bad guys fall down,'" says Bill Dermody of Springfield Armory. "Our stuff works." These words were in my mind as I fired the Urban Socom 16 while rotating it along its axis to 3, 6 and 9 o'clock and then held the stock firmly against the front of the concrete firing bench. Boom, boom, boom. Just like John Garand intended it. The range officers were not amused. The shorty M1A with the cool stock pattern just spit casings, whether Hornady or Federal, tactical or target. No magazines sliding out, no counterintuitive controls, no awkward chamber checks and no adjustments necessary. It fired 100, 155 and 168 grainers with equal aplomb. The 1:11-inch twist favors the lighter bullets and loves the Hornady TAP with the 110-grain V-Max. Even out of the 16.25-inch, six-groove barrel, it zips along at almost 3,000 fps. Springfield actually recommends Hornady's TAP with the 110-grain V-Max as fodder-of-choice. Some designs run just fine sitting pretty on the bags, but the true test of a semiauto design is whether it will fire at angles and while hot and dirty. More than 200 rounds went through the rifle a week before, and no cleaning had been done except a bore punch. As most of you know, a rifle possessing marginal operating capabilities will not function well when recoil is increased or decreased, hence tests such as limp-wristing or the stock-on-bench trick. Springfield has offered the Socom 16 as a law enforcement, military and personal-defense answer to concerns about the stopping power--as in now--of short-barreled .223 carbines. It offers the quick handling of an AR with the boom-flop of Dad's deer rifle, allowing perpetrators to rapidly assume room temperature. Also, the Socom is an ideal counterpart to accurized M1As or other .308 rifles, serving as a spotter's rifle or "Oh fudge!" grab piece. When mated to top-drawer optics, it has excellent accuracy and can out-reach an M4 in the same role. On a much more timely note, when loaded with ball or heavy M118 loads, this 8.9-pound pit bull can bash through auto-body parts and still have energy left to go to work on suicide bombers approaching the odd Mesopotamian checkpoint. Springfield Armory has been building M1As since it bought the original tooling from the government arsenal in 1974. Nowadays, the crew from Geneseo, Illinois, machines and tempers some components from castings purchased domestically, uses state-of-the-art CAD/CAM tooling for others and uses some OEM parts and the original 1957-vintage machinery to build the rest. Various models have been introduced since then, with the M25 arriving in '01 and the original black-stocked Socom debuting in '04. The USS Ohio's 16-inch gun turrets each had a backup firing computer. It was a steel box the size of a large television filled with brass gears. On the top were dials and number wheels, and around all four sides were little cranks. Every possible variation was calculated, and the firing solution appeared on the top of the half-ton box. To answer demand for more rail space, Springfield Armory has launched a second-generation with a detachable A.R.M.S. S.I.R. system. While this is quite functional, it looks odd as the Star Wars angularity of the S.I.R. clashes with the lean grace of the traditionally shaped stock. Most observers would prefer some sort of chin rail, perhaps as part of the upper sling swivel. Speaking of the stock, S.A. offers it in black composite and the new LE camo, which was a happy accident: The company asked a supplier to come up with something "urban and cool," and the result was an immediate hit. Since 9/11 there have been a series of military purchases--just small enough to avoid drawn-out bidding and testing but large enough to strain production--of the entire selection of M1As. Additionally, numerous police departments are rediscovering the reliable simplicity, user-friendly operation, proven ergonomics and terminal-effects advantages of this proven veteran. With the White Feather, Springfield Armory now has a tackdriving M25 with earthy etchings to honor the Marine Corps' most celebrated practitioner of the art of "reach out and touch someone." The honoree, of course, is Gy. Sgt. Carlos N. Hathcock II, USMC (Ret). You read about him in the book Marine Sniper, you saw his exploits ripped off in the movie Sniper (really--Tom Berenger shoulda known better), and some of you were lucky enough to meet him at lectures and seminars before his death in 1999. Fortunately, Gunny Hathcock lived long enough to etch his wisdom into a generation of American marksmen, just as his signature (along with his nickname--in English and Vietnamese) is now etched into the receivers of these fine rifles. Basically a much-upgraded version of the Carlos Hathcock introduced in 2001, the White Feather's McMillan fiberglass stock is stippled on the steeply dropping grip, comes with a recoil pad and an adjustable comb, and hosts a Harris bipod forward. The muzzlebrake on the 22-inch Krieger 1:10-inch, four-groove barrel is sleek, lacking a front sight as the rear is taken up by a Navy-style, John Clements-inspired scope mount. This is mounted to the rear-lugged receiver. The whole effect is one of lean economy, a sort of "just the facts, ma'am" approach to reliable, semiauto long-range accuracy. "A .300 Winchester Short Magnum would be outstanding," Dermody says wistfully, but he admits there is no current plan to introduce tasty alternatives to .308. "We're building them as fast as we can and can't keep up with demand," he says of M1A production. "We just knocked out a wall to expand part of the line." My local club's rangemaster, Dr. Elliot Milch, did the range test with Federal's sublime 168-grain Gold Medal Match. With three five-shot groups, it averaged a hair over 13/16 inch. But we found that it was definitely not happy with 168-grain TAP, offering only 3.5-inch groups. Sturmschreiber David Fortier recommended lighter bullets, so I got some of Hornady's 155- and 110-grain TAP and headed back to the range. VoilÃ , you'da thought I hit the previous groups with Preparation H. Both the 155s and 110s shrank down to 1 1/2 inch--and that was off the bipod. The White Feather M25 is now the flagship of the Springfield Armory line and is as accurate and reliable as it is collectable. Today Horus Vision offers you that same capability in a rugged palm computer the size of your cell phone. Used in conjunction with a Kestrel 4000 meteorological tester, your ballistic data and the Sammut-designed reticle, it plots your aiming point down to the gnat's tush. A warning: Unlike the USS Ohio, it does not factor in bore wear or rotation of the Earth. The Horus Vision is a state-of-the-art fire-control system for professionals. It's not for the sportsman who likes to play with reloads or who takes his buck every year from the same treestand. But if you can get past the intimidating first look through the reticle, and you are a shooter who uses the same load at varied long distances on a regular basis, there isn't a better system out there. 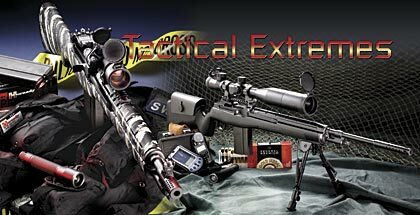 For the professional hunter who shoots at varied long distances or the military or police sniper who uses his rifle regularly, it is a superior surgical tool. If you never shoot beyond 300 yards, it is an extravagance but still fun to play with. Unfortunately, mechanical difficulties thwarted our range testing, so readers will have to wait for a dedicated article on the Horus Vision in the next issue.